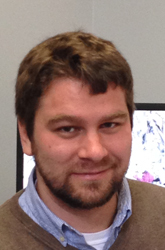 Bryan Cwik (PhD Philosophy, University of Virginia) is a postdoctoral scholar at Penn State University’s Rock Ethics Institute. Bryan’s primary research focuses on issues at the intersection of practical ethics (esp. bioethics and business ethics), philosophy of science, and social and political philosophy. His research project at Penn State is on ethical issues raised by interactions between the community of scientific researchers and the biotechnology and pharmaceutical industries, with a special focus on the role of intellectual property in structuring those relations. He is also very interested in more general questions in political philosophy about topics like global justice, international trade, property and the nature of ownership, and intergenerational justice; in ethical theory and moral psychology about the nature of moral judgment; and in the history of early modern philosophy, esp. the moral and political philosophies of Hobbes, Hume, and Adam Smith.